Get great accessories for yourself or the design or type geek in your life. 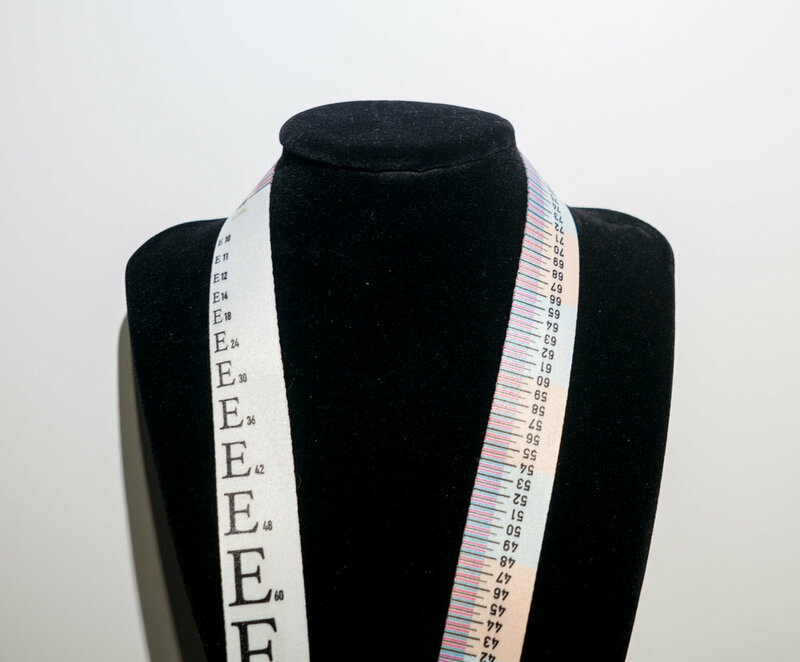 Are you a graphic designer or typographer and want a lanyard that speaks to your type-geek soul, looks wonderful, stands out, and doubles as a convenient measuring tool for inches, picas, centimeters, and leading? It’s also silky smooth and comfortable. I’ve designed this premium lanyard that meets all those marks! Manufactured in the U.S. by Buttonsmith in Carnation, Washington—a worker-owned union shop—this lanyard offers the rulers mentioned above. The rulers span 18 inches (in 1/8th increments), 108 picas (with 2-point markers), and 45.5 cm (with marks every 5mm). The accuracy is within about 1/16th of an inch or 3 points in all scales when laid down, but held on each end, it's almost exactly accurate. The type gauge shows an E in Helvetica and Garamond in popular type sizes from 10 to 72, and offers a leading gauge for 11, 12, 13, 14, 15, 16, and 18 points. It also features common unit conversions for points, picas, inches, and centimeters, and has 1/4th and 1/8th fractions as decimals (like 1/8th = 0.125 inches) for quick reference. A jaunty 19th century illustration of a piece of metal type sits above the ring and badge clip. The clip has a quick-release squeeze action, and the clip is attached to a keyring to which you can add other items.